Cookies and doughnuts were the order of the day when Kelso House sixth year, at St Andrew’s High School in Coatbridge, wanted to raise money for Let The Children Live! after learning about the work of the Charity from a Presentation given by George McAleenan. Sold by Syra Farooq and Fallon Cuthill, they were obviously delicious as they raised £282—which is a lot of cookies and doughnuts! Sadly, I was not there, or they would have sold more!! 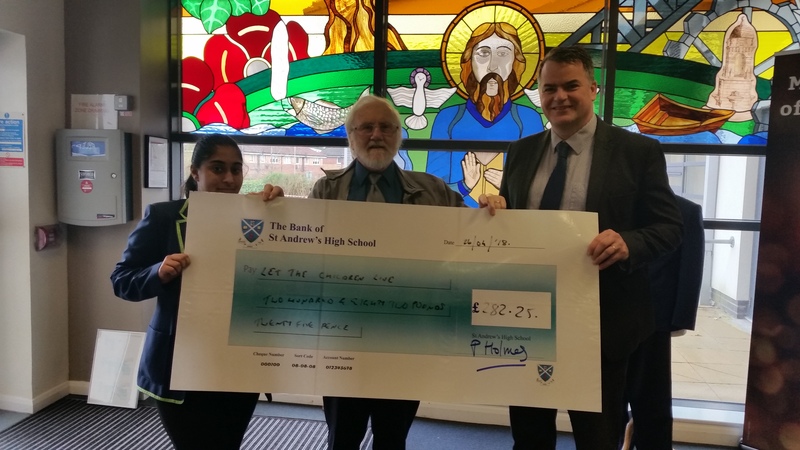 Syra Farooq and Headmaster Mr Peter Holmes present the cheque to George McAleenan, who is in the centre of the picture.